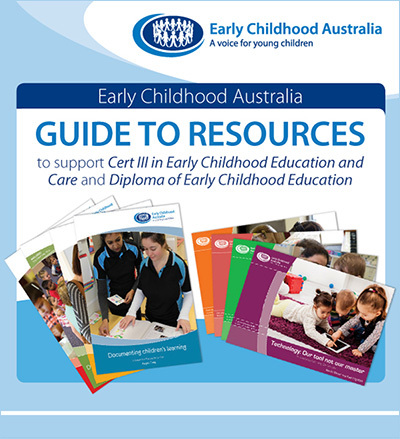 The Early Childhood Australia Guide to resources to support Cert III in Early Childhood Education and Care and Diploma of Early Childhood Education lists competencies that have been linked to our publications—providing you with background knowledge on what resources will most benefit students and staff. View the latest version of the ECA Guide to Resources here. Please note: The document does not include all of the competencies—only the ones that link to ECA resources. This document is a ‘working document’ which will be updated as required. We encourage you to subscribe to our range of valuable ECA publications to ensure you don’t miss out on upcoming titles in the Everyday Learning Series and Research in Practice Series. Each book now includes links to the National Quality Standard and children’s services competencies. Subscribe today to ensure you don’t miss any future issues. Visit www.earlychildhoodaustralia.org.au/eca-subscriptions/ to find out more or phone 1800 356 900 (free call in Australia).